Our guest poet, Lois Troutman, is back and this time with a Dancing With The Stars Christmas jingle! THANKS LOIS and Merry Christmas! March will come sooner than we think, Season 18 within our sight! HO HO HO, MERRY CHRISTMAS, 2014 IS ALMOST HERE! HOPE YOU DANCE WITH HAPPINESS INTO THE NEW YEAR! By the looks of it, Dancing With The Stars Mark Ballas really brought some heat as he performed at a Revd Music & Dance event at Palace Hotel last night in San Francisco, California. You can view some new photos of Mark at this event at Getty Images. Instagram below courtesy of emodels1. 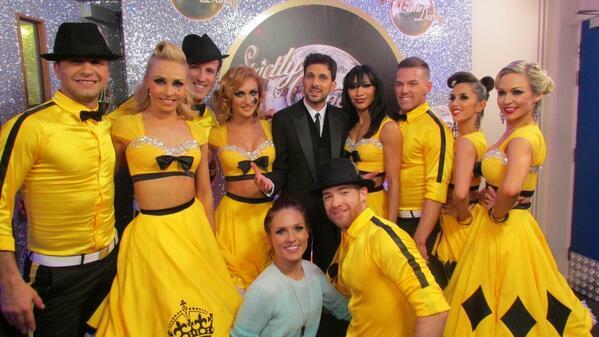 Sharna Burgess has been busy! Right after the season of Dancing With The Stars wrapped up, she and boyfriend and dancer Paul Kirkland flew to London to do some choreography for “Strictly Come Dancing” (the English version of Dancing With The Stars). Below are some fun examples of their recent work! Pic above courtesy of pro Iveta Lukosiute. DWTS Pro Watchout: Blake McGrath To Dance On Dancing With The Stars? Could the producers be thinking of asking Blake McGrath to dance on Dancing With The Stars…or maybe they did already?? OR maybe this is just a campaign? We’ll let you decide!! Last night, Blake posted the instagram below with the caption, “Who thinks I should join the professionals on “Dancing With The Stars” next season? If you think so type #blakefordancingabc @dancingabc #tbt #sytycd1 #samba”. If you’d like to read up on Blake, visit this link. Note that along with being a singer, Blake has also been on “So You Think You Can Dance” and “Dance Life”. He’s also danced with greats like Madonna, Britney Spears, and Janet Jackson to name a few. So what do you think? Blake to dance? I say…YES depending on who he’d replace. A definite yes to replace Tony or to be on the Troupe!! Thanks to Elmari for sending us this news.